It isn’t that this is a bad film, not at all. It’s that it is very very nearly a really good one. Watching The Discovery you get a sense that with a few different people behind it it could have really stood out from the multiplex crowd. The clever story revolves around the scientific discovery that there is an after life and how the suicide rate has skyrocketed as a result. Robert Redford plays the man behind this incredible realisation and Jason Segel is his sceptical son. Highly celebrated and twice Oscar nominated Rooney Mara also features as a mystery woman with a possible agenda of her own. It isn’t the cast that are wanting though, it’s the direction. With David Fincher at the helm, or Denis Villeneuve or Nicolas Winding Refn, The Discovery could have been so much more suspenseful and the chemistry between the leads so much better. The reveal of what is really going on after people die should have been an astonishing revelation, the twists ought to have been exciting, but as it is it all just trundles along to a poetic but lacklustre ending. With a really good director this would have been better and would have almost certainly seen the inside of cinemas. As it is it’s a typical example of what was once known as ‘a straight to video gem’, good but a little lacking. I don’t want to be too harsh on Charlie McDowell (who incidentally is Rooney Mara’s husband and the son of Malcolm McDowell and Mary Steenburgen, who also appears in the film). He writes the film as well as directing and the script is strong. McDowell will probably do interesting things in the future but he’s not a player yet. The conceit of the movie is intriguing and mercifully avoids becoming a horror film which it may well have done with studio interference. It does feel derivative of a range of things from Twelve Monkeys to Black Mirror though and if you’ve seen a lot of these types of movies then the denouement is satisfying but not a surprise. It also has a chunk of exposition at the end from a character that wouldn’t really have the knowledge to explain these things quite so easily. Villeneuve would have never have used such a clumsy narrative short cut. I enjoyed The Discovery. It isn’t going to change history but see it now if it sounds like your sort of thing, there’s certainly no need to wait for the DVD release. 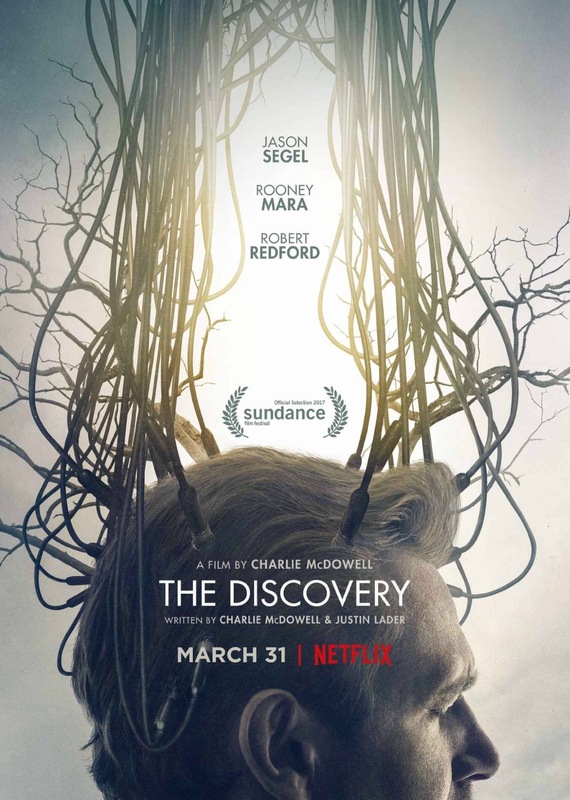 Because it is streaming The Discovery has not been rated by the BBFC but on Netflix it is listed as a 15. It isn’t scary or particularly disturbing but it does have themes heavily centred around death and mortality.